Photographs of the first store in Banks, which was owned by brothers Ewell and Montgomery 'Gum' Turner. 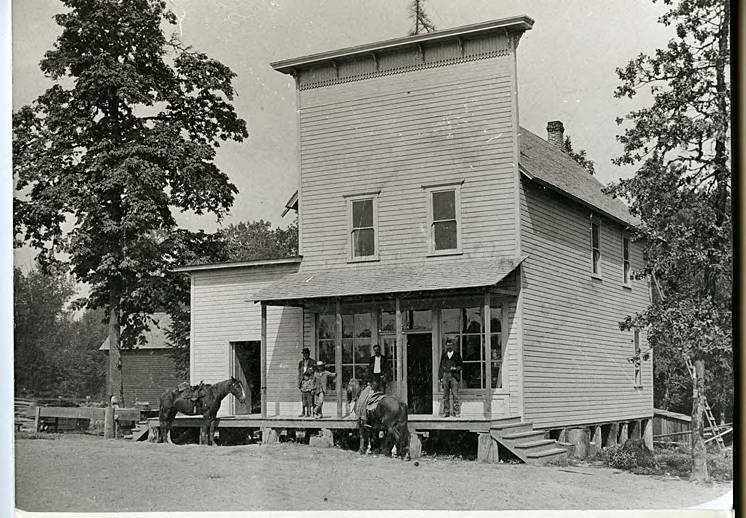 [caption] First Store in Banks Built About 1901 North Main Street Near Banks Road; Brothers 'Gum' Montgomery Turner (owner) born 1866, center, Ewell Turner born 1870 -- the store's first operator which lasted about four years. 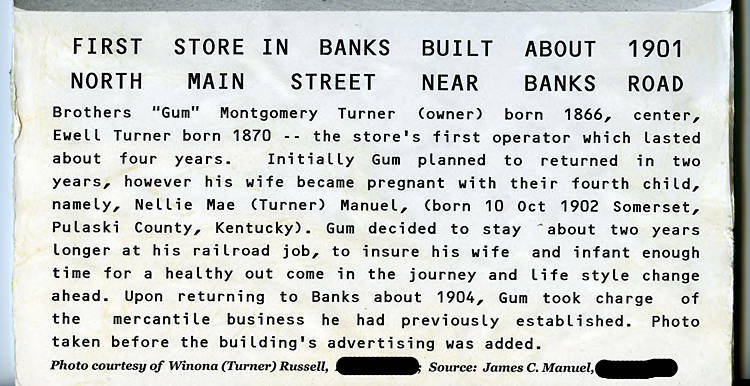 Initially Gum planned to returned in two years, however his wife became pregnant with their fourth child, namely, Nellie Mae (Turner) Manuel, (born 10 Oct 1902 Somerset, Pulaski County, Kentucky). Gum decided to stay about two years longer at his railroad job, to insure his wife and infant enough time for a healthy out come [sic] in the journey and life style [sic] change ahead. Upon returning to Banks around 1904, Gum took charge of the mercantile business he has previously established. Photo taken before the building's advertising was added.